What makes Field Trials so valuable? The Astrium hosted PRoVisG Field Trials tested state-of-the-art planetary imaging technology over a period of 11 days on the beautiful island of Tenerife. 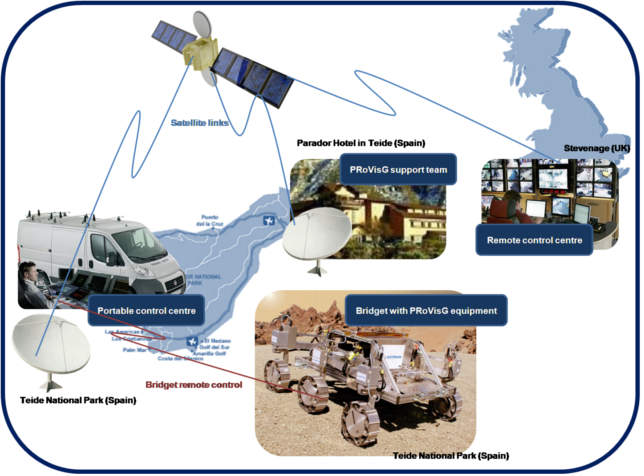 The Bridget Rover has now been returned to the UK and the PRoVisG team continue their work in processing the image data gathered during the trials. They will post more cool videos to this site as they become available. In the meantime, We begin with the Telegraph report about the trials - click to watch it. And feel free to browse the site and see the action and fun we've had over the last few days. To see the best pictures of the Field Trials go to the following PicasaWeb Link.